Can the Evolving Gig Economy Extend to Corporate Leadership? The modern business world is a place that values strategic focus and agility. Not only do people not expect to work thirty years for the same company and then retire—they’d feel stagnant and unfulfilled if they did that. Many of us think of the “gig economy” as something starving artists do, working several jobs to make ends meet. But the gig economy is actually a project-based, results-oriented model that can be extremely powerful at the leadership level of any company or organization. In top tiers of business, this type of leadership is an interim leader: an experienced senior executive engaged on a fixed-term contract with 100% focus on delivery, who is not distracted by internal career ambitions or organizational logistics. Interim leaders drive transformational change, and as such, are an increasingly sought-after resource. 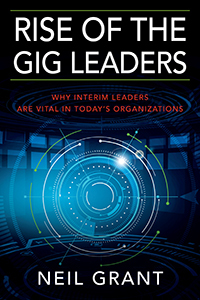 Rise of the Gig Leaders examines in detail the phenomenon of interim leadership, clearly explaining its benefits, implementation, and potential. Whether you’re an experienced executive looking for a new challenge, or in charge of an organization that needs an infusion of vision and energy, this unique and fascinating book points the way to opportunities that can be transformative.